over $400,000 and there was a mandatory payout that day. The industry took notice as a small racetrack was getting unusual attention, even taking some attention away from the Derby itself. $700,000 in new money was wagered on the Pick 6 that day. Some observers saw this as a good thing. Even Andy Beyer wrote an optimistic article on Jackpot bets, and he was probably the first person to bring up the idea of developing Hi 5 Jackpot wagers. Although Jackpot Bets may be good for an individual racetrack because the majority of money being wagered originates off-track and larger jackpots attract some players to play a track they may not have without the jackpot, these wagers collectively kill churn. Also, there is no evidence to show that Jackpot wagers create new customers and it is common sense that customers are using "extra money" on these bets. Horseplayers do not have "extra money." With horse racing handle on a downward spiral, especially when taking into account inflation and population growth, from an industry standpoint it makes no sense take away potential churn. For racing to grow, horseplayers need to be engaged. The biggest way by far that they are engaged is by having money to play the next race or the next day. 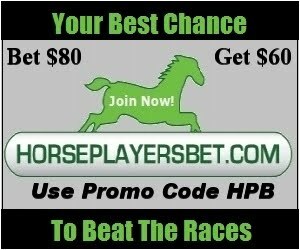 Keeping horseplayers in the game keeps them focused on horse racing 24/7, this means there is a chance that family members and friends may get exposed to the existing player's passion. Not only do Jackpot wagers take significant churn dollars away, when someone hit it (with the exception of mandatory days), the lucky winner is unlikely to churn back the winnings any time soon, also the winner is taxed if the Jackpot is high enough, and this represents lots of money that is forever taken from the potential churn pot. It is tough to expect a track like Gulfstream to take its Jackpot bet off the menu as arguably part of its current success could very well be attributed to the Rainbow 6, but this goes hand in hand with today's racetrack culture which is all about competing for a shrinking piece of the pie, not growing the customer base. Problem is that tracks are contributing to the shrinking the pie even more by offering Jackpot wagers. Racetracks see Jackpot wagers as a marketing tool, and there certainly is a lot of interest on mandatory payout days at tracks like Woodbine and Gulfstream Park especially, but the build up to those days isn't worth it for the industry. Surely there must be alternatives tracks can use. A fifty cent Pick 7 would generate frequent decent carryovers if they become popular, for example. A nationwide lottery similar to Sweden's V75 would be fantastic as it would bring in "extra money" from new potential players, though it would take a lot of cooperation by jurisdictions and racetracks to get it to go. Canada has national lotteries, however, in the US the closest thing to a national lottery is Lucky For Life which now available in 23 states. Another positive about such a lottery is that it potentially can be used by the horse racing industry to get into states that currently do not allow wagering on horse racing. Just a thought. This article can also be found in HANA's Horseplayer Monthly, Keeneland Edition.